Specify page size and number of labels per direction here. In our example we use 5 labels per page horizontally and 10 labels vertically on an A4 page in portrait direction. After entering those values into the dialog close it by pressing the 'Finish' button. 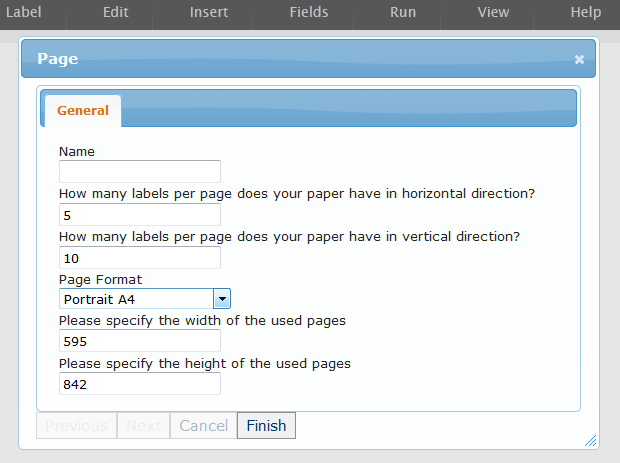 Afterwards you can open the Page dialog from the 'Fields' menu by double clicking in 'Label and Page Attributes'.